Troodon was a carnivore (meat-eater) that lived in North America during the late Cretaceous period, about 74 to 65 million years ago. It was one of the dinosaurs that died out in the Cretaceous-Tertiary extinction 65 million years ago. Troodon was about 6 feet (1.8 meters) long, 3 feet (0.9 meters) tall, and probably weighed about 130 pounds (60 kilograms). Troodon was one of the cleverest dinosaurs, having a large brain in proportion to its body weight. It was probably about as smart as a modern bird. Some scientists have even suggested that were it not for the Cretaceous-Tertiary extinction, Troodon, or one of its relatives, may eventually have evolved human-level intelligence! In 1982, paleontologist Dale Russell and taxidermist/artist Ron Sequin created a model of a "Dinosauroid" based on their speculation of what an intelligent evolved descendant of Troodon might have looked like. The name Troodon means "wounding tooth" and refers to the animal's sharp teeth with serated edges. North American Dinosaurs - Troodon lived in North America. Troodon was a genus of dinosaur. Troodon was a member of the Saurischia ("lizard-hipped") order of dinosaurs. What this means, is that although Troodon was not closely related to lizards, it did have similarly shaped pelvic bones. Troodon was a Theropod - a member of a group of related bipedal dinosaurs that included the ancestors of birds (although Troodon was not itself an ancestor of birds). Troodon lived between about 74 million years ago and 65 million years ago, during the late Cretaceous period. Troodon was one of the dinosaurs which died out during the Cretaceous-Tertiary mass extinction at the end of the Mesozoic Era. Troodon lived in North America. Troodon was a carnivore (meat-eater). Troodon was about 6 feet (1.8 meters) long, and about 3 feet (0.9 meters) tall. Troodon weighed about 130 pounds (60 kilograms). 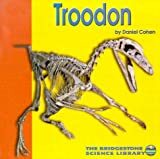 Provides information on the physical characteristics, behavior, habits, and relatives of the dinosaur known as Troodon. Presents facts and speculations about the physical characteristics and behavior of this small, swift, carnivorous dinosaur. Table of Contents Introduction Chapter 1: Appearance and Behavior Chapter 2: Environment Conclusion Author Bio Bonus Dinosaur Content Introduction to Dinosaurs Facts about Dinosaurs Dinosaur Extinction Dinosaur Fossils Dinosaur Eggs Dinosaur Names Dinosaur Diet Feathered Dinosaurs Plant Eating Dinosaurs The Weirdest Dinosaurs The Deadliest Dinosaurs Flying Dinosaurs Kinds of Dinosaurs The Biggest Dinosaurs The Smallest Dinosaurs Author Bio Publisher Introduction Salutations young reader! Today we are going to embark on a journey back to the age of the dinosaurs. The dinosaurs are some of the most incredible animals that ever lived on our planet. They lived nearly 200 million years ago and thrived for about 165 million years. We humans have only been around for about 60,000 years and we have only been using computers for about 75 years. The dinosaurs mysteriously became extinct and disappeared from our earth, but left their fossilized remains behind. Dinosaur fossils have been constantly discovered in human history; the Chinese thought they were dragon bones and Europeans thought they were the bones of biblical monsters. Luckily, the scientific study of dinosaurs began in between 1815-1824 with the discovery of an Iguanodon fossil. Since then dinosaurs have been discovered all over the world. Their immense size, strange shapes, and wonderful natures make them inherently worthy of interest. The study of dinosaurs requires depth of imagination, analytical skills, and thought. The many unanswered questions about their lives, behavior, and disappearance provoke the curious to seek answers and ask even more questions. I hope this book fuels your imagination and makes you want to learn even more about dinosaurs. I hope you learn to appreciate the value of the dinosaurs and that you bring a spirit of openness and wonder on your journey back to the age of the dinosaurs. We know what we know about the dinosaurs from a variety of sources including fossils, biology, and other scientific disciplines. Fossils are the ancient remains of the dinosaurs, the most familiar being their bones. Biological science is the study of life in general, but many scientists compare the dinosaurs to modern day animals to support their theories. In this book we are going to talk about the Troodon. The Troodon was one of the first dinosaurs discovered in the United States. It is interesting because it is one of the smartest dinosaurs that ever lived. We will not only talk about scientists figured out it was intelligent, but also about its probable behavior and relationship with its environment. Before a talk about dinosaurs can take place it is important that we discuss the theory of evolution. Evolutionary theory supposes that all the animals we know and see today are the direct descendants of animals that existed millions of years ago. The dinosaurs and other creatures that existed millions of years ago either died out or gradually changed into different animals. For instance, birds are considered to be surviving dinosaurs because their dinosaur ancestors survived the dinosaur extinction event (we will discuss this later). The Troodon is considered by scientists to be a direct ancestor or very close relative to modern birds. Remember that any time you see an * next to the name of a dinosaur, it means that a book has been written about this dinosaur in the Dinosaur Books for Young Readers series. Any word written in bold is an important scientific term which is defined in-text. Italics are used to denote the first time a dinosaur’s name is mentioned in the book. Third graders Nate and Emily meet Professor Reginald Barrister and travel into the Cretaceous, where they encounter the terrifying raptors known as Troodon. Full color interior with thirteen illustrations. Troodon's name comes from words meaning 'wounding teeth,' which seems very appropriate for this mighty dinosaur! Follow scientists as they uncover how Troodon spent its time on earth so many millions of years ago. Troodon Victory by Rory Smith : How The Dinosaurs Were Wiped Out. 66 million years ago, the Troodons, had a civlisation that dominated the Solar System. They had colonised new planets, asteroids and Moons. But it was all brought to an end. Read the story of how the greatest civilisation in history, was destroyed. You have been told an asteroid wiped out the dinosaurs. But this is really what killed them off. Can we learn from their mistakes? Read the story of the species on Earth, Mars, and Venus. Learn of the ruthless leaders President Empiress, and General Havoc. The story is over 3700 words long. Describes the discovery, identification, and classification of Troodon, a dinosaur that had the largest brain and perhaps the greatest intelligence of any of the ancient reptiles. Describes the characteristics, behavior, diet, life cycle, and enemies of the Troodon. WHAT'S INSIDE: Our Educational Dinosaur Set includes 15 beautifully-crafted, fierce dinosaurs with vibrant colors and rich textures. Your child will have endless hours of fun playing with Jurassic creatures of epic proportions. Made from high-quality, 100% child-friendly non-toxic plastic, these Jurassic dinosaurs will spark hours of imaginative play as your children encounter legendary creatures from the past! Toys are designed to promote motor skills, hand-eye coordination, and a load of fun! 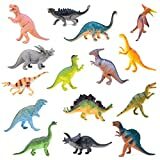 15 piece pack of large 7" toy Dinosaurs. Enormous variety of authentic type plastic Dinos. Great as Dinosaur party supplies, birthday favors and more. Troodon is a mischievous mid-size predator. He is obsessed with food and mainly preys on baby pachyrhinosauruses who are too young to defend themselves. Micro Machines Cretaceous #6 Collection. The Original Scale Miniatures. The approximate size of a Micro Machines Figure is 1.5 inches long. Produced by Galoob in 1998. The approximate size of a Micro Machines figure is 1.5 inches long. Approximate size of unopened packaging is 8 x 7.5 x 2.5 inches. Battery operated dinosaur toy has ON/OFF switch to make it moving, roaring and light up. Kids can operate easily and have fun. Hi, I'm T Rex the King of Dinosaurs. Join me on a Jurassic World of lights&sound. 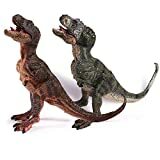 Delight your kid's imagination with this awesome walking T Rex toy.Battery operated dinosaur toy has ON/OFF switch to make it moving, roaring and light up. Kids can operate easily and have fun.SPECIFICATIONS: Dimensions: 7.5"(L) X 5"(W) x 10"(H); 3 X AA batteries required (not included). Recommended for children ages 3 and up. Imagine hours of fun playing with realistic ancient animals designed especially for your unique collection. 2. This models comes Without original box. Walk with the dinosaurs with this deluxe action figure set! Each order includes Patchi, Scowler, Gorgon, and Troodon for a full scale of playtime opportunities. 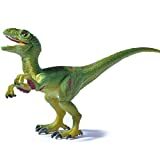 Each dinosaur figure is fully poseable, measures 7'' from tip to tail, and features a small variety of roaring sounds when buttons on their backs are pushed. Makes a wonderful gift for the dinosaur lover! Imagine hours of fun playing with realistic ancient reptiles designed especially for your unique collection. ☺Exercises imagination and creativity; helps children to learn with pleasure while playing and having fun. 1. Contain small movable part not suitable for children under 6 years of age. Cannot be eaten. The range of CubicFun 3d puzzle is a new form of construction toys ideal for children, adolescents and adults. CubicFun products are distributed in more than 80 countries in the world and are a reference for lovers of 3d puzzle. In addition to the fun develop curiosity and add a strong educational content. rappresnetano an ideal gift for all ages. Make any surface come to life and watch your child interact and tell stories while playing! Full color print stickers stick on surfaces most traditional clings do not and are 10 times as thick as normal stickers. USA Consumer Product Safety Commission Tested and Certified Non-Toxic and Safe for Children! Your dinosaur lover will roar with excitement when they get their hands on our Dinosaur Window and Wall Clings. These non-scary Dinosaur clings are great for solitary or group play! Watch your child interact and tell stories while playing with the Dinosaurs. Make any surface come to life with our Dinosaur Window and Wall Clings. They can decorate any bedroom, playroom or add an exciting touch to your child's next party! These full color print stickers stick on surfaces most traditional clings do not and are 10 times as thick as normal stickers. Our Dinosaurs won't go extinct, they are extremely durable and can be easily taken off windows, doors, walls and continued to be played with time and time again. The Dinosaur Window and Wall Clings are USA Consumer Product Safety Commission Tested and Certified Non-Toxic and Safe for Children! They are designed here in the USA with your little one's interests in mind. 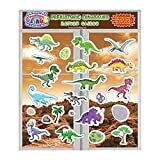 When you purchase this unique Dinosaur Window and Wall Cling collection you will receive a 22 piece Set in an 11" x 12" package containing small and larger Dinosaurs like the Parasaurolophus, Spinosaurus, Tyrannosaurus, Pterodactyl, Pachycephalosaurus, Compsognathus, Anklyosaurus, Stegosaurus, Plesiosauria, Brachiosaurus, Troodon, Dilophosaurus, Velociraptor, Triceratops, Mesozoic, Cretaceous, Dig and Teeth.